Social Historian, Sarah Hayes is the Collections and Exhibitions Manager at Newman Brothers Coffin Works in Birmingham. Discovering she had an ancestor working in the funeral trade in Birmingham over 150 years ago, and then of her daughter living on Fleet Street, just ten doors down from what was to become Newman Brothers Coffin Works is almost poetic symmetry. Sarah has worked across the museum sector in the West Midlands, United Kingdom, since 2005 in a variety of positions. In the last five years, her positions have included working as a Freelance and Project Curator at Birmingham Museum and Art Gallery and Thinktank, Birmingham Science Museum, and most recently as Collections and Exhibitions Manager at Newman Brothers, Coffin Works. As a social historian, Sarah’s passion for people and Birmingham’s industrial heritage has always inspired her interest in the past, and securing a position at Newman Brothers in January 2014 was a real career highlight. Having curiously ‘watched’ the project since 2005, Sarah had kept a ‘watchful’ and intent eye on the progress of the project with a deep desire to one day become involved. That dream was realised just over a year ago and now she is actively engaged in preserving the history of Newman Brothers and the history of coffin furniture manufacture in Birmingham, the home of its mass production. One of the greatest joys of this job is communicating this story to the public and revealing the importance, as well as demystifying the history of a relatively ‘closed’ trade in an effort to elevate the importance of Newman Brothers on a national and international level. Family history never ceases to amaze me, especially in how we can often unknowingly mirror the endeavours and actions of our ancestors. In fact, a recent discovery of an ancestor working in the funeral trade in Birmingham over 150 years ago, and then of her daughter living on Fleet Street, just ten doors down from what was to become Newman Brothers Coffin Works (my current place of work) is almost poetic symmetry for me. For those unfamiliar with the project, Newman Brothers made coffin furniture for over 100 years between 1894 to 1999 on Fleet Street in the Jewellery Quarter. But failing to meet the demands of changing-industrial processes, largely dictated by the ‘plastics revolution’, as well as simply running out of steam, meant that Newman Brothers finally closed its doors in 1999, leaving everything behind. Everything is the operative word here, because everything from machinery, coffin handles, breast plates, company ledgers to a bottle of whiskey along with cans of soup were discovered. These objects will form the basis of Birmingham’s latest heritage attraction, allowing people to step back in time and experience the history of this company and of this trade. 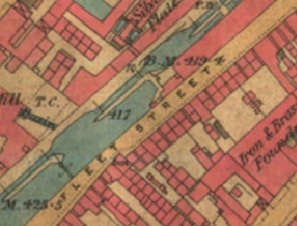 Late 19th-century map showing Fleet Street. Caroline’s daughter, also called Caroline, lived briefly at number 3 Fleet Street in 1891, located near the corner of Newhall Street. Just a stone’s throw away, she may well have seen the construction of Newman Brothers, which began in 1892. My connection to this trade is through my great-great-great grandmother, Caroline Derkin, who at the age of 17 was described as a ‘coffin-furniture maker’ on the 1861 census. Discovering that I have a direct connection to this trade through one of my ancestors was a special moment indeed, and has fuelled my passion for this project even further. Coffin furniture covers a broad spectrum of products and as there was a division of labour between genders at this point, it’s most likely that Caroline was either working in the ‘soft’ furnishings division of this trade, making shrouds, linings and other textile-based products, or equally feasible is that she may have been working on the more industrial side, operating fly presses for cutting and piercing metal, another female-oriented role. ©Sarah Hayes. 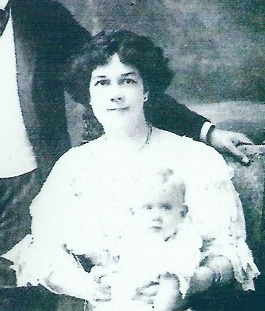 My great-great grandmother, Caroline Wilkes, daughter of Caroline Derkin, who was living on Fleet Street in 1891. In 1851, there were nine master-coffin-furniture manufacturers in Birmingham, but the ease with which coffin furniture could be made, meant that goods could also be produced by a number of other non-specialist metal firms who made similar products, using the same industrial processes.This makes it difficult to pinpoint exactly which company Caroline was working for, but as she was living on Cecil Street in the New Town area of the city, it’s likely therefore, that she was working within walking distance of her home, as was the norm during this period. 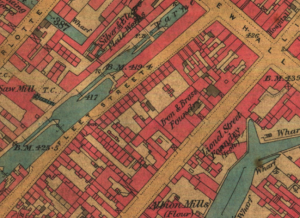 The red pin shows the location of where Caroline Derkin was living in 1861 in the New Town area of the city. But, regardless of where she was working, it’s her connection to this Birmingham industry and more specifically, her direct connection to me and her legacy to my own story, that somehow brings me closer to her, and in a funny sort of a way, is an appropriate epitaph to our family’s history. She made coffin furniture and I’m attempting to preserve it. And it’s exactly that, the personal sense of preserving her story in my endeavours to preserve the history of Newman Brothers’ that has made this project yet again even more personally satisfying. What she’d make of a museum dedicated to the history of coffin furniture 150 years on is beyond me, but the story of Caroline Derkin has brought me closer to a chapter of Birmingham’s history and somehow for me, anyway, legitimised my role in preserving and exhibiting the history of this important Birmingham trade.